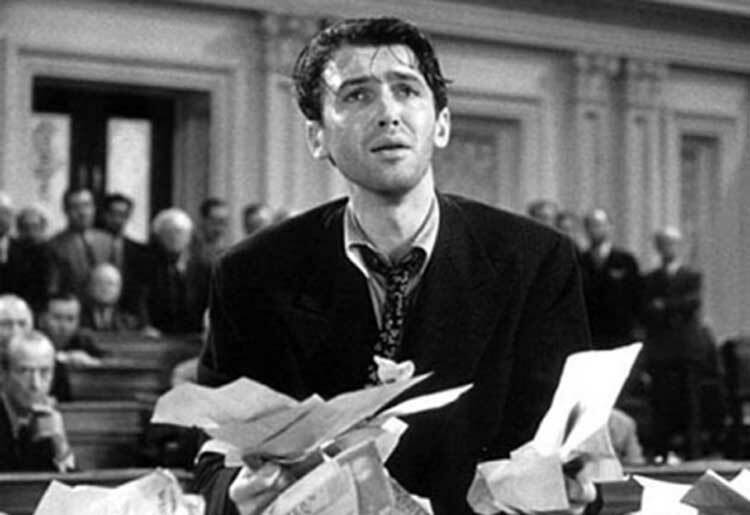 The second choice in my Politics on Film marathon is Mr. Smith Goes to Washington, Frank Capra’s highly acclaimed fable pitting democracy against the powerful forces of corruption. Can Jimmy Stewart convince me that our system of government has a chance? Small-town idealist Jefferson Smith (Jimmy Stewart) receives a surprise appointment to the U.S. Senate when the current senator dies suddenly. He arrives in Washington with stars in his eyes but fails to realize that corrupt players are using him as a stooge. Smith decides to speak up against an unlawful use of land, but bigwig Jim Taylor (Edward Arnold) and his long-time Senator Harrison Paine (Claude Rains) try to destroy his young career. Working with his assistant Clarissa Saunders (a wonderful Jean Arthur), Smith takes one last stand to clear his name and stop his crooked opponents. On one hand, Capra and writer Sidney Buchman’s idealistic look at the Senate and Washington feels a bit silly. However, they also have a sharp understanding of the possibilities for corruption in positions of power. I’m not sure I’d call the interactions realistic, but they are definitely believable in the environment created for the film. This was actually a very controversial movie at the time of its release because it didn’t present a rosy picture of the U.S. government. Watching it today, I found the cynical look at our political system made the story a lot more effective. Stewart’s wide-eyed idealist has no idea about the chaos he’s entered. After arriving in Washington, he tours the famous monuments and grins like a kid in a candy store. It doesn’t take long before Taylor and Paine find a way to nearly crush Smith’s dreams. While the story takes place in the late 1930s, the issues of choosing personal gain over the country’s welfare are relevant today. The major conflict involves building a dam that will earn loads of money for Taylor and his cronies. We’ve seen in the recent financial crisis how the government tends to forget about its citizens. An intriguing figure is Senator Paine, who’s wonderfully played by Claude Rains. Once a well-meaning guy, he’s been overwhelmed by ambition and has pushed aside his ethics. Smith represents the man he once was, and the nasty actions Paine takes to save himself finally overwhelm his conscience. I should also mention the cynical take on the Washington press corps, who focus more on spin than finding the objective truth. Thomas Mitchell shines as the constantly drunk journalist Diz Moore, who hangs with Saunders and adds some light-hearted fun. Pinned into a corner, Smith takes charge and initiates a filibuster in a last-ditch effort to stop the bill. Staggering around the Senate floor after countless hours, he gives one final speech to convince his foes to do the right thing. This moment reveals Stewart at his best and shows a young star taking his shot at movie greatness. It’s no surprise that this film was ranked by the American Film Institute among the most inspiring every released. You do have to accept the ludicrous nature of this filibuster, but it makes for great entertainment if you push aside concerns about realism. Looking at how Smith would function today, it's an odd question. Obviously, Smith is a great guy who would place the American people well above his own personal goals. I do find his big plan to create a national boys camp to be pretty silly, but it seems like an excellent idea to all the kids we see, so I guess it’s okay. If Smith could learn more about how the government works from his new love Saunders, I think he’d be worth my vote. I’d also probably vote for Henry (Harry Carey), President of the Senate, who seems like the most sensible guy in the whole group. Dim-witted Governor Hubert Hopper (Guy Kibbee) would definitely not get my vote. I know it’s considered a classic, but I’m still surprised at how much I enjoyed this movie. Stewart and Capra make a perfect team, and the excellent group of supporting players, especially Arthur, Carey, and Mitchell, complement them well. Even though some critics have become too cynical to like Capra movies, I love this film. Good review. Chip, I noticed that a few of your comments when you went through the entire blog slipped by. I'm going to try and respond to these soon. Like I say in the review, I agree that this is a very good film. Thanks!